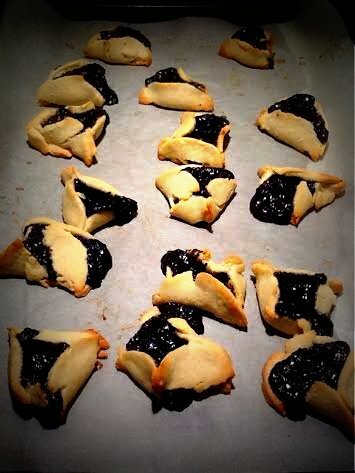 Hamentaschen (or Hamentashen, or Hamantashen), the tri-cornered cookies filled with poppy seeds, fruit jelly, nut mixtures, etc. were not part of my childhood holiday experience. Torrone nougat candy, bow-ties covered in powdered sugar, Italian bakery cookies, sesame and pistachio halvah……these things were. Regardless, having a penchant for experimenting with holiday favorites – anybody’s holidays – I might make an Irish soda bread for St. Patrick’s Day, Easter Bread for Easter, potato latkes around Hanukah; and of course the usual pumpkin and pecan pies for Thanksgiving, the Christmas cookies at Christmas. You get the idea. Celebrating with food is just such a great thing to do, and any cause for celebration is a good cause. Give me your holidays and an idea and I just might try it. Eid ul-Fitr, Makar Sankrat, Pongal, Chinese New Year. Any and all are wonderful. I’m game. 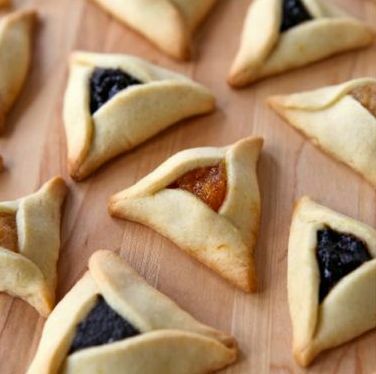 This year, more than usual and probably due to social media, I have been noticing much mention of Hamantaschen for Purim. I have eaten them but never made them, so I decided to make my own, for the first time. Before I go any further, it is a good idea to mention that I am not proficient at baking. I love to cook. I love the freedom of manipulating a recipe and being loose with it. And as a matter of fact, my forte is being able to whip up a meal when there is virtually nothing left in the kitchen and it is well past the time to go grocery shopping. This skill, born of past necessity, has managed to serve me well. Show me that old can of beans in the back of the cabinet, the few stragglers at the bottom of the vegetable bin. The forgotten last bit of dried quinoa stashed in a jar. The one lonely egg. A can of tuna fish maybe. Some cellophane noodles from a Thai dish that was never made. Some left over nuts. It doesn’t matter what it might be. With a few spices and some ingenuity, I can probably pull something together – often something interesting and filling that still tastes good. At times it has even been sort of a personal challenge to still see how long I can go until someone has to cave in and buy some more food. But baking. Well. Baking is just a little more precise. It’s not that I don’t follow the directions – I do, even though I hate hate hate to follow directions. And the results always taste good. The problem is that they rarely look good. When I see the gorgeous Christmas cookies that some of my friends make, I am in awe of their skill, of the perfection, of the Martha Stewart-ness of it all. Mine (which are usually only your typical oatmeal cookies – I can’t move beyond that) are juvenile by any comparison. My cookies are too fat, too thin, too weird looking. My cakes are crooked. My icing is bloppy. OK, I’ve had a few successes with pies, but not always. I concede baking is just not my thing. It is just not relaxing. However, that doesn’t stop me. 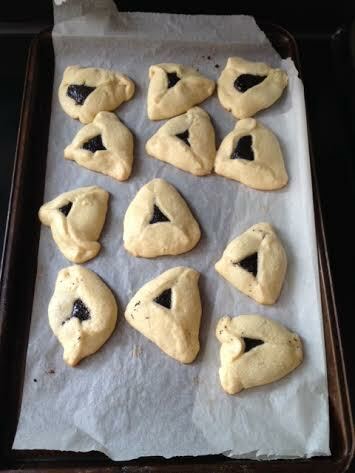 So back to the Hamantaschen. Although I had a recipe from a friend, I decided to first check the internet and found a Jewish site with a Hamantaschen recipe. I figured that was probably a good source – who would know better? But almost immediately, I began having trouble with the dough. Part of the trouble is that I ate a significant portion of the raw dough before even getting started. While the dough was chilling, I was going back and forth to the refrigerator to take more and more pieces of the raw cookie dough. It is something I just can’t resist. I was flummoxed! They must have been overfilled. And I must have cut the circles too small. They certainly tasted good, with a dough that was not too sweet, which countered the very sweet filling. But they looked so unappetizing. Luckily, the Significant Other didn’t seem to be put off by appearances, and ate most of them (which were not many, since I had already ingested the aforementioned dough). Undaunted, the next day I actually tried again, which is rather unlike me. But really, who can’t make a triangle? 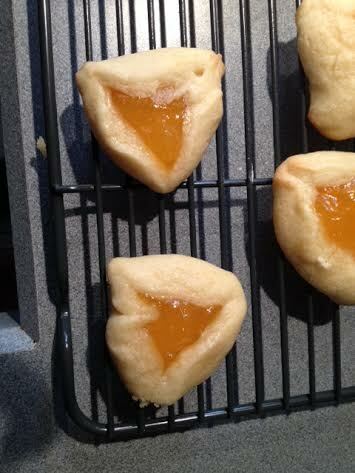 This time I used a different recipe I had gotten from my friend R. – a sugar cookie recipe that she stated could also be used for Hamantaschen. It rolled out a lot easier. One setback – I also ate a whole lot of the raw dough again; a much sweeter dough. Luckily, there was a lot more left to work with, as this made a big batch. This time I cut the circles bigger and used less filling. 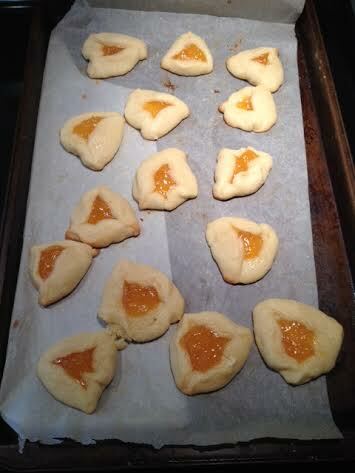 I also included some apricot filling in addition to the poppy seed ones. I certainly hope that the S.O. will enjoy all this Hamantaschen – three large containers of them – because I would be too embarrassed to even give these away. Were I still employed there, I would not even bring these into an office filled with hungry coworkers who eat just about anything, for fear of ridicule the minute they set eyes on them. I will add that, by this point I was almost going into sugar shock from all the dough eating. So badly in fact, that I actually had to go lie down with a headache. Afterwards, because for some reason I just can’t let this one go, I researched and found yet another recipe and instructions for Hamantaschen that seem to address a lot of the problems I was having. But I think it is time to move on to another holiday. This entry was posted in Cooking, Food, Humor, Uncategorized and tagged cookies, Hamantashen, Hamentaschen, Hamentashen, holiday cookies, I can't bake, Purim cookies. Bookmark the permalink. Next year we should make them together. I’ll show you a few finer points and they will come out just perfect. The dough should be rolled out a little bit thinner. Then you have to pinch the dough to close them a bit more, but mostly you’re being much to critical. They look fine. I was too lazy to make them this year. More power to you! That’s what is SO awesome about being retired – you get to really take your time and enjoy the little things. They all look like they’d taste delicious, and I would eat them and enjoy them, without minding their shape one bit!